Flail Hammer Blades or Knives Blades for Flail Movers? Home » News » Flail Hammer Blades or Knives Blades for Flail Movers? "I would like to buy an Orsi 209 flail mover delivered with Y knives blades, but I preferred flail hammer blades. I'm just puzzlled which one is more suitable. I want to promote good pasture health in the paddocka, but also a nice finish on my lawn areas around the house. The flail mover will also be used for clearing of regrowth where there is a strong possibility of hitting tree stumps and branches, and small and large rocks. It will be much appreciated if any experience or opinions are provided." When you design or buy a new flail mower, you will have a choice of the Y Knife Blades or Hammer Blades. The Y-Blades are great when cutting tall weeds and overgrowth and can also offer a nice cut to your lawn. However, if you are need to cut tree saplings and dense overgrowth, the flail hammer blades are used, which are wider, heavier blades than the Y-blades. No matter Flail hammer blades or Y knife blades, either set of blades will make a perfect solution for cutting. Although flail movers are very effective when cutting overgrown grass, clearing brambles, and the perfect tool for hedge cutting even like a tree branch, it is very important for you to choose the right option. 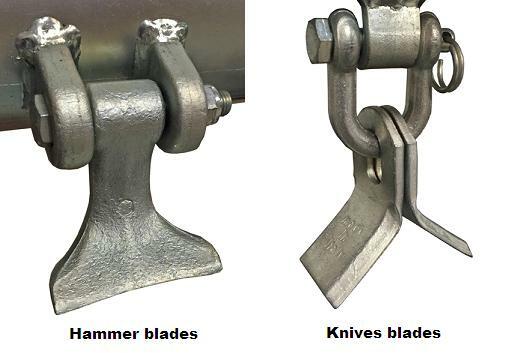 Below we will introduce different types of blades (hammer blades vs knives blades) for flail movers. When cutting grass and brambles, a flail mower head fitted with knives, or Y shape blades is the best choice. They are more of a knife and less of a mulcher and they leave a very clean cut and a much tidier looking finishing. Besides, the Y shape blades (knives blades) can also be used for light hedges and they can cut branches up to 2 inches (some of our customers use them to cut much thicker things but this is not recommended!!) The knives are standard fitting for the LS1 series of hedge cutter, for mini diggers from 1,5 to 2 Ton, but can be used with flail mower heads up to 1200 mm for machines up to 16 Tons. However, in most cases, more “cutting power” is required to remove thicker branches, or simply don’t want to worry about what they are going to hit when cleaning an area or they cut hedges. In this case,we suggest the flail mower head fitted with flail hammer blades. Flail movers with hammer blades can cut up branches up to 4 inches, and moreover, they can cut everything the Y shaped blades can do (grass, brambles, briars and bushes). So the fuction of hammer blade flail mover is stronger than that of Y blade flail movers. That is why flail hammer blades are more common sold in the market. To longer the lifetime and save cost, such flail hammer is mostly manufactured in forged steel. As the top manufacturer of forged flail hammer in China, we can custom flaill hammer blades in different sizes for more applications. Our closed die forging technology will make the flail hammer blades more stronger, so if you are the flail mover manufacturer or flail hammer/ knives blades dealers, and have the purchasing plan, pls contact us. We can provide you all the forged implements (flailer hammer blades, knives blades, bolts, clevis, bect) for flail movers!!! Hello do you have a minimum order? Do you have hammers for a Sicma flail mower?